Use 2 per Turnback (Looped Back on Itself), designed for use when Terminating 620 (CM 9080) and 618 (ROHN 618) wire strand used for Telescopic Mast Down Guy Wire. These Galvanized Drop Forged Steel Cable Clamps are easy to use and could be used in conjunction with 1/4 Heavy Open Eye Thimbles when necessary (Part Number 1/4THH is a Separate Item). Consult ROHN Catalog Link Below for ROHN H Series Telescopic Mast Down Guy wire Details for Various Wind Loads. Compare to Channel Master CM-3095, ROHN 1/8CCF, Texas Tower 1/8CCM and Antenna Systems 1/8CCM and 1/8CCF! 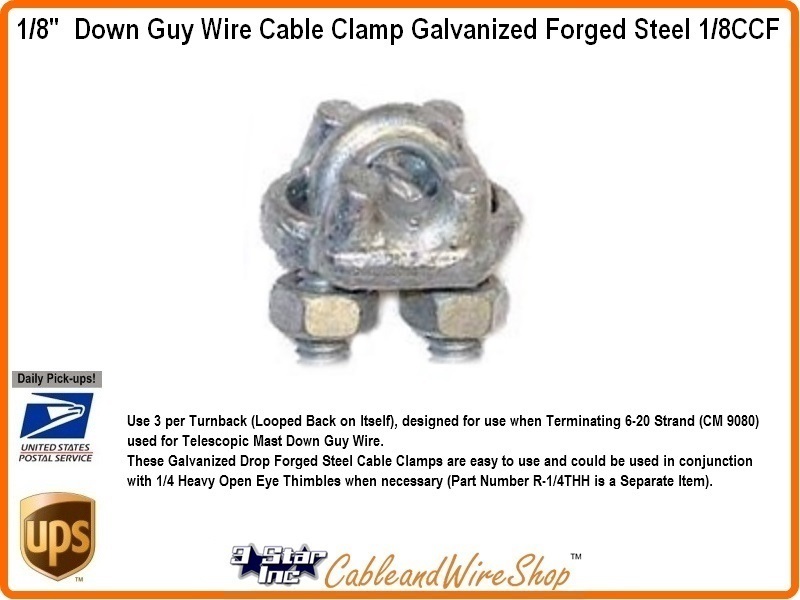 Note: This 1/8CCF Galvanized Drop Forged Steel Cable Clamp is specifically designed for use with 620 (CM 9080) and 618 (ROHN 618) Guy Wire Strand for ROHN Telescopic and Regular Antenna Mast Guy-Off during Mast Erection, Permanant Installations, Temporary Installations and Take-Down Dis-Assembly. Works great when used with a Open Thimble insert when attaching to Guy Wire Anchors (Sold Separately).